The U.S. Patent and Trademark Office on Tuesday awarded Apple a patent that describes a method for efficiently manufacturing curved touch surfaces, suggesting the company may be experimenting with curved iOS device displays. 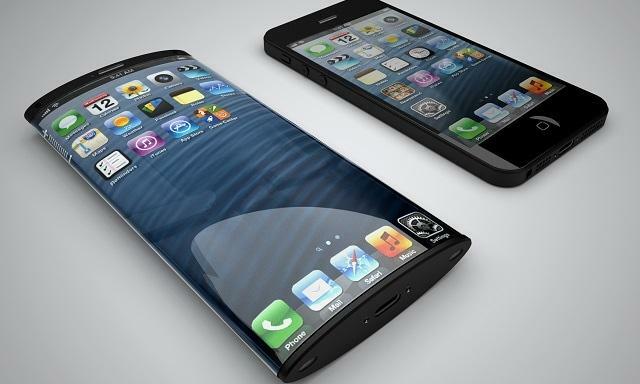 Curved iPhone concept, via MyVoucherCodes. Apple's U.S. Patent No. 8,603,574 for a "Curved touch sensor" details a manufacturing technique that produces accurate, curved touch surfaces without deficiencies caused by substrate warping or deformation. The patent's claims specifically cover use of the technology in displays, touch pads and touch mice, among other devices. Apple notes that current touch panel technologies, specifically stackups containing thin-film conductors, are difficult to work with due to a "desired thinness of the substrate and thin film." For example, when depositing thin films over a flexible substrates like plastic, the annealing, or heating, temperature must be kept relatively low to avoid structural damage. Manufacturers, however, may prefer to employ high annealing temperatures for added thin film resistiveness and enhanced optical properties. To avoid deformation due to the annealing process, the patent proposes a technique that deposits a conductive thin film over a flexible substrate while it is in a flat state. Once the electrodes are in place, the substrate package is joined to a curved "forming substrate" and subsequently heated. The process results in a non-deformed curved touch sensor stackup with a thin film that benefits from the high-temperature anneal. As noted in the patent, some current applications do not have true curved touch surfaces. In the graphic above, the figure on the left represents a regular flat touch stackup, with cover glass on top and LCD display on the bottom. The middle illustration represents a simplification of a structure that does not use Apple's curved touch panel technique. To give the appearance of a convex touch surface, the thin film (109) is deposited onto the substrate and capped off by a domed cover glass (104). While the setup may appear curved to a user, touch sensitivity may be degraded due to the distance between the surface of the glass and the drive and sense electrodes in the thin film. On the right is a constant wall touch sensor panel that can not only reduce thickness (y) compared to the flat-substrate design, but will keep touch sensitivity at high levels since the distance between the cover glass and thin film is unchanged from a completely flat stackup. 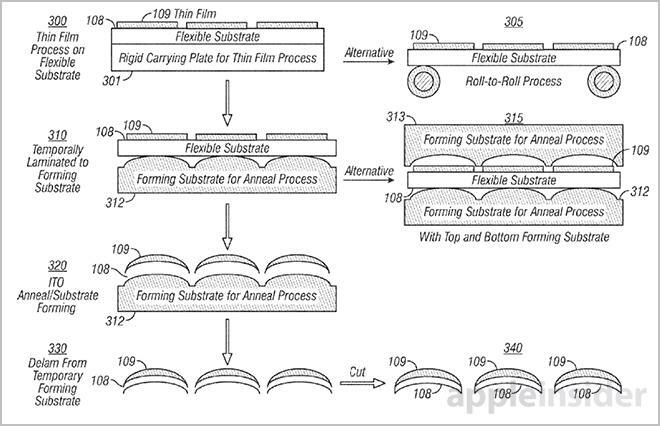 Apple's patent allows for this type of process without deformation of the substrate or damage to the drive lines. The document also notes the technique can be used to form more than one curvature, such as a wave or other surface shape, by employing a second or third forming substrate. It is unclear if Apple will use the above-described method in a consumer product, though curved displays seem to be en vogue at the moment. Rival smartphone maker Samsung has released a curved model called the Galaxy Round, while LG recently debuted the LG G Flex that boasts a concave flexible display. 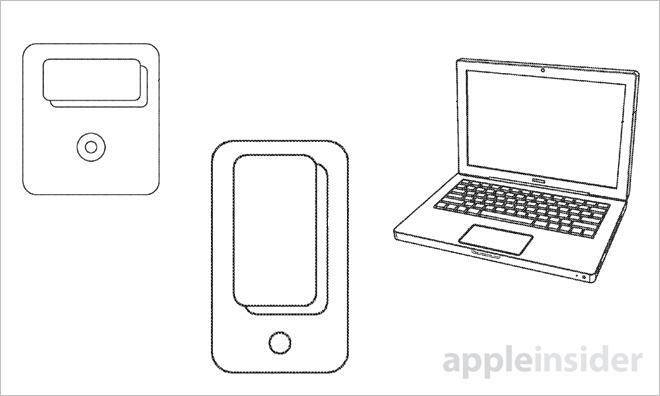 Apple's curved touch surface manufacturing patent was first filed for in 2010 and credits Lili Huang, Seung Jae Hong and John Z. Zhong as its inventors.